This photo is used under a Creative Commons license by Ins1122. 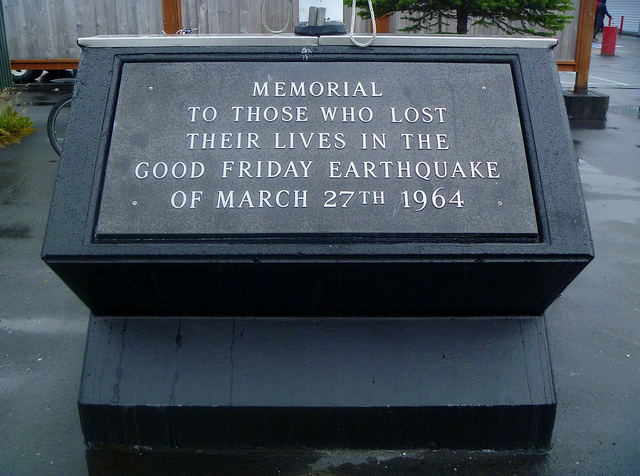 This week marks the 50th anniversary of the record-breaking Good Friday earthquake that shook Alaska on March 27, 1964. It was the second-largest earthquake ever recorded, causing widespread destruction throughout Southcentral Alaska. The magnitude 9.2 shake lasted as long as five minutes, its devastation causing the Prince William Sound community of Valdez to relocate four miles from its original location. Located just two hours northeast of Valdez, the Copper River Princess Wilderness Lodge allows guests easy access to explore the nearby town and experience its history firsthand. Today, the quaint, coastal community of Valdez is known as the southern terminus of the trans-Alaska oil pipeline and a prime fishing and outdoor adventure destination — certainly worth the trip for those contemplating excursion options from the lodge. Guests can inquire at the tour desk for more information on the thrilling Valdez Coastal Kayak Adventure, or the more relaxing Prince William Sound Glacier Cruise. Both excursions include transportation to and from the lodge and depart from the busy Port of Valdez. Guests are treated to the breathtaking scenery of Prince William Sound, where Alaska’s marine wildlife is frequently on display, and knowledgeable guides can share additional information about the area and effects of the historic earthquake. Panoramic image of Valdez Marina in Summer 2013. History buffs won’t want to miss out on a visit to the Valdez Museum, an excellent source of information on the town’s history, including the 1964 earthquake. In commemoration of the historic event, the museum will unveil two new exhibits and a series of events this spring and summer to honor Old Valdez (the original town site before the earthquake) and bring new insight to the historic event. On March 27, the museum’s Egan location will unveil “A Moving Experience: A Look Back at the Good Friday Earthquake,” a permanent exhibition featuring rarely seen artifacts, photographs and more. Extended viewing opportunities at the museum’s Hazelet Ave. location will also be available for visitors March 27 through April 5, from 12 to 5 p.m. Tuesday through Sunday. This location houses the “Remember Old Valdez Exhibit,” a scale model of Old Valdez as it was before the earthquake in 1963. The “Communities, Disaster and Change” temporary traveling exhibition will be on display at the museum from May to Sept. and features artwork by 28 local Alaskan artists. Guests are invited to inquire at the Copper River Princess Wilderness Lodge Tour Desk for additional information on customizing a visit to Valdez to commemorate the 50th anniversary of the Good Friday earthquake as well as other adventure opportunities in the area.